Let’s end with the moon and some poems. The Library was short and sweet and sweaty this year. We’re ending on a cool note, or with a lack of blazing sunshine anyway. 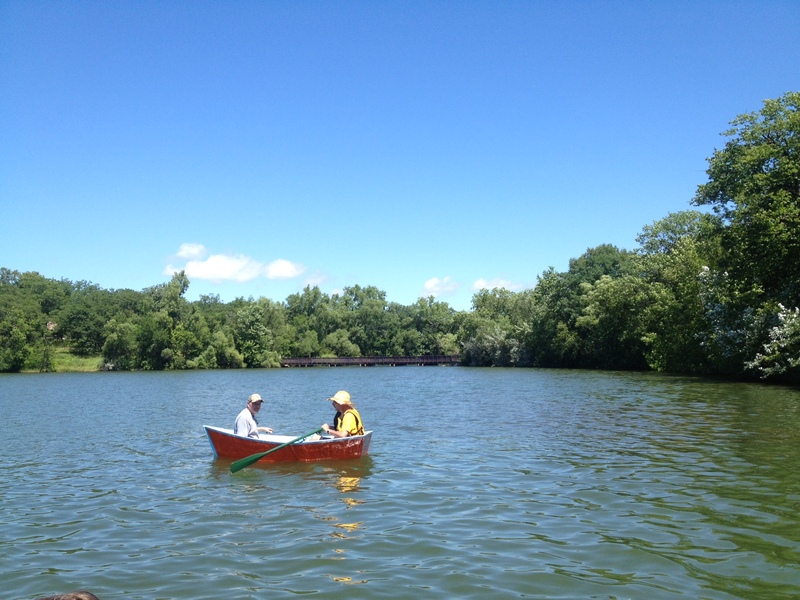 Join us for a Moonlight* Paddle and Poetry Reading this Saturday, August 1, beginning at 8:30 pm. Docked just off the tip of Silverwood’s Picnic Island, the raft will serve as a floating stage shared by three writers. Poet-in-residence Steve Healey will share some of the “floating poems” contributed by Library visitors as well as his own words; Kathryn Kysar will read from her collection Dark Lake, which graced the Library shelves and narrowly avoided drowning by being checked out, and Library volunteer, actual librarian and writer Clarence White will share his work. Come and listen from sea or from shore. Canoes, kayaks and some inflatable rafts are available free of charge on a first-come, first-served basis courtesy of Three Rivers Park District beginning at 8:30 pm. The reading will begin around 9 pm. All paddlers, including those bringing their own boats, will be asked to wear glow bracelets for safety. The reading can be heard from land. Because this event is at dusk into darkness, the Library’s collection will not be on view. After the reading join us for a camp fire on Picnic Island. *Technically the full moon is on Friday, but that night is the Boat Ballet on the Mississippi River with which we’d be fools to compete! Choreographed by Patrick Scully, organized by Scully and Kalen Keir and “danced” by 99 paddlers in canoes, kayaks and paddle boards, this is a dream summer time water happening. I’m proud to say that the Library’s own Sea Clamp will provide on-water technical transport to the ballet’s musicians. See you there too! Two legit librarians were our first patrons; many boaters found us by surprise; some lake residents came and checked out books (and returned them! ); I met one of the 2014 artists with whom I’d only corresponded with via Facebook; some New Yorkers who’d never been in a canoe before paddled out; Scout the dog came with a fancy dog lifejacket; Steve the floating poet read every book in the collection and got a funny sunburn from one of those woven straw hats; Steve and I also signed and dipped the 6 copies of A Book Dipped in Two Lakes to complete the edition; the photographer’s camera was not lost when he fell out of a canoe trying to get a good shot; lovely reporters from MPR came to visit and wrote up a nice piece; some artists from Chicago canoe-delivered a book that includes a head of cabbage. All-in-all, we were sunburned and smiling having shared beautiful objects with so many visitors. And then at the very end of the day on Sunday the canoe transporting the entire collection back to shore capsized. The Library canoe was not alone in this drama, as four canoes turned over that day due to the intense wind. 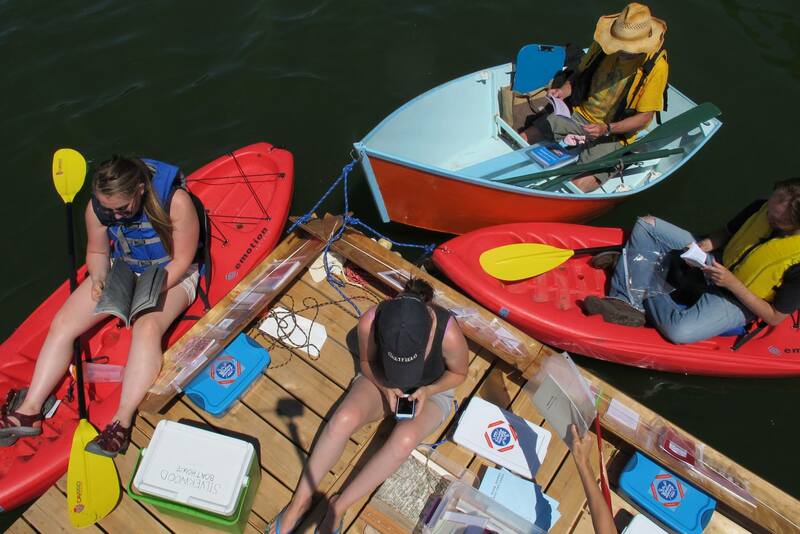 Mostly importantly, the humans in the boat were fine — Silver Lake is thankfully not so deep — but all of the books in all of the tubs went into the water. 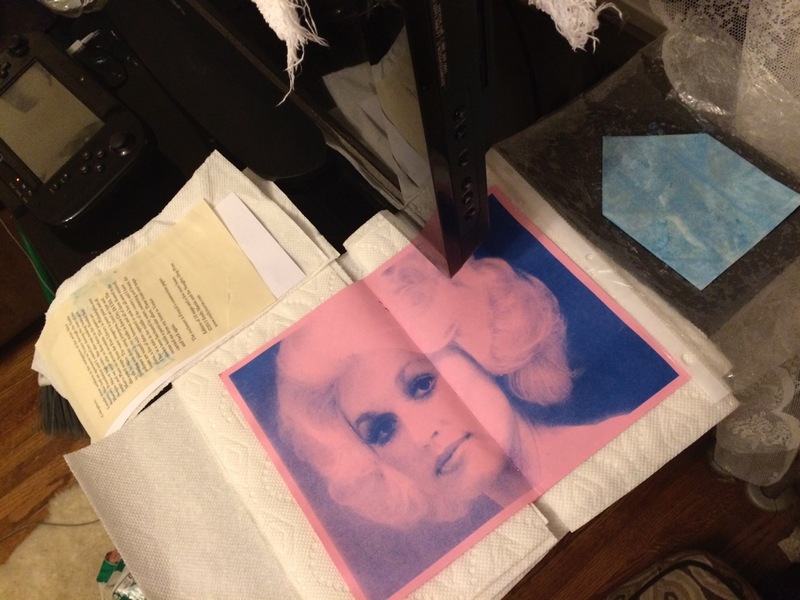 What ensued from there was an important lesson in resiliency, both of paper products and of spirit. 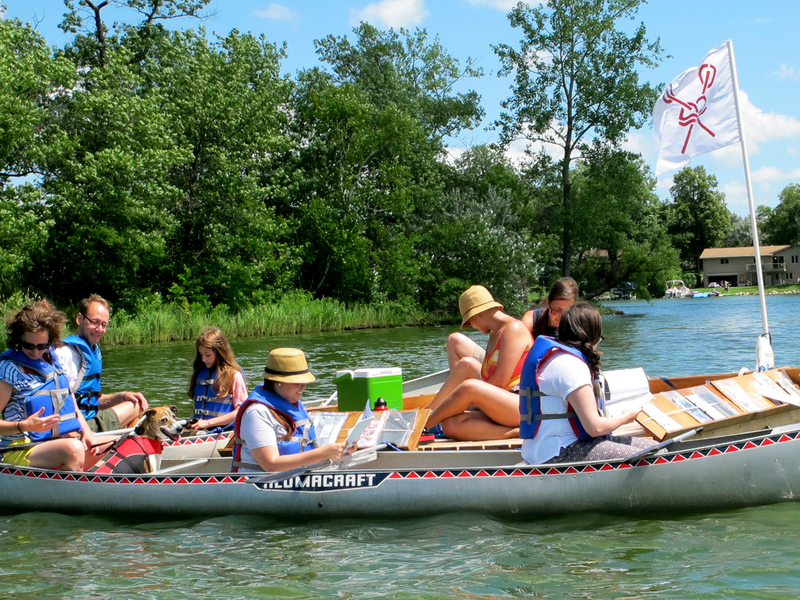 Amazingly, the volunteers in the canoe rescued every single tub and all of the books. A Silverwood staff person swam around the lake in their work clothes to collect all of the stray Ziploc bags. The park director drove over in the golf cart to bring all the soggy books up to the Visitor Center. 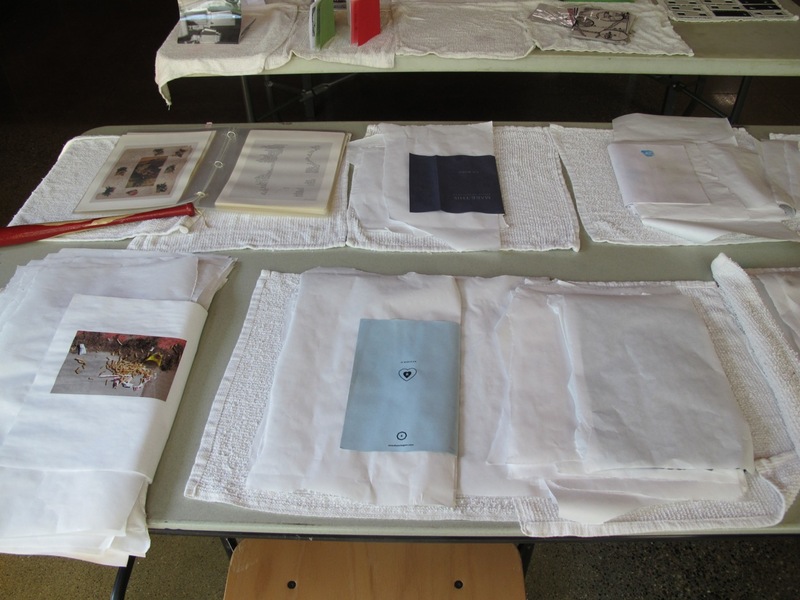 Another staffer set up tables in the Great Hall as a make shift triage center and found us loads of cloth towels. Two Library volunteers stayed until 9 pm to help lay out the books for drying. 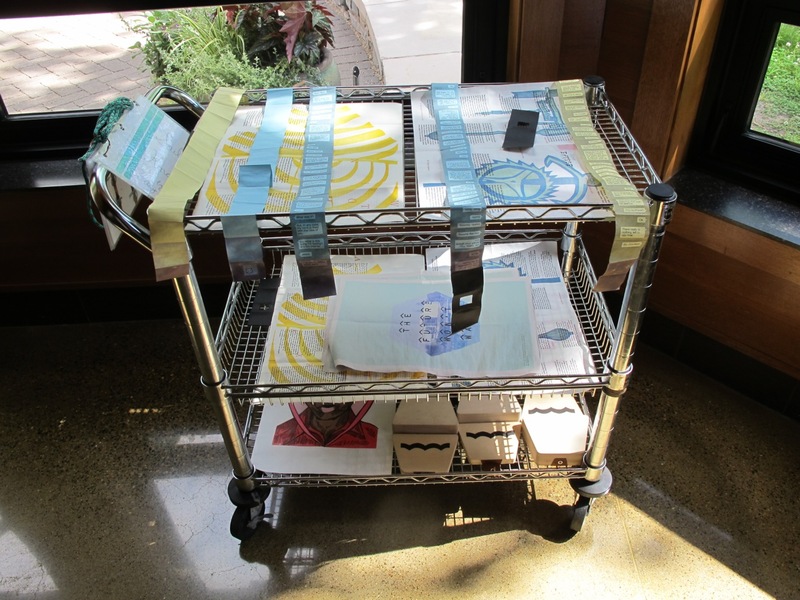 Another Library volunteer took several of the one-of-a-kind books back to her studio where she spent hours leafing in waxed paper between pages and even re-binding a couple of books. Triage table in the Great Hall. Triage cart in the sun, day 2. Sarah Stengle’s studio saving the day. Dolly gets a face lift. 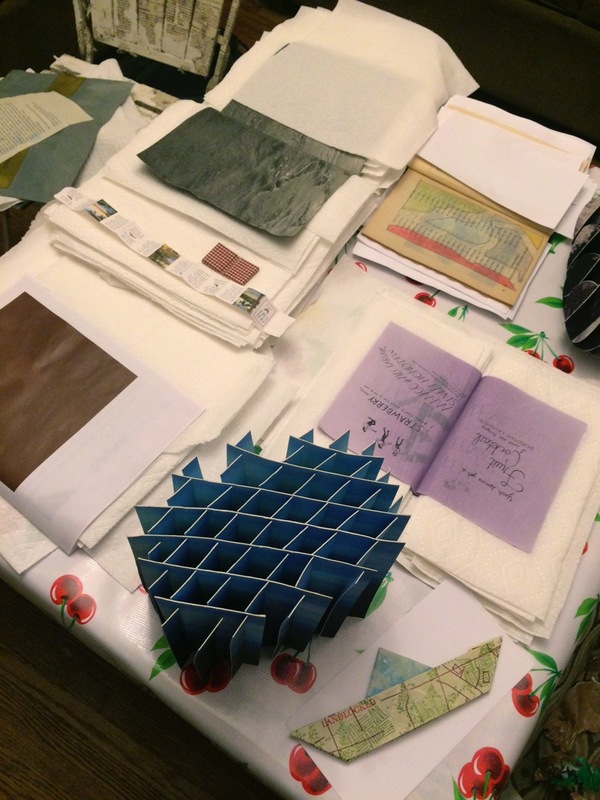 Over the past five days I’ve used countless paper towels and rolls of waxed paper as I’ve tended to books drying on my dining room table. 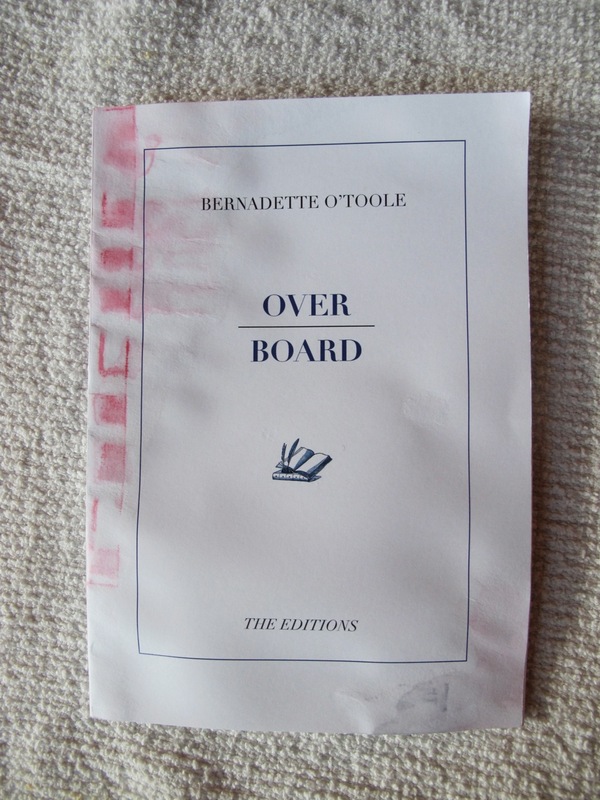 It is a pretty profound act of care and intimacy to save a drowned book. You have to turn the fragile pages over and over. 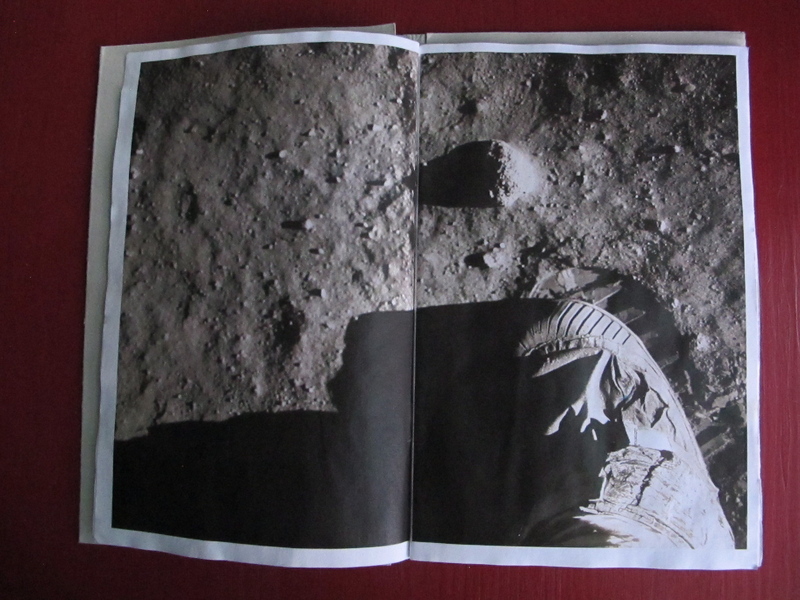 You see the book as a whole object – a structure, but also as fragments of a collection of letters, words, images, paper, thread. Sometimes I would lose attention for the task and sit and read poems on damp pages. I’m humbled by this material called paper that can become completely drenched and then reform itself, the same but different. I’m so grateful for the volunteers for all of their help, for the Silverwood staff for going along with this madness in the first place and all of the artists for understanding the risks of such an endeavor. Come see the new collection! It’s been transformed. Photos one and two by David Eberhardt, a photographer with a mostly perfect sense of balance in a boat. Who’s that in the orange boat? A floating poet, of course. This year the Floating Library is honored to be working with Coffee House Press to host a poet-in-residence through the esteemed In the Stacks program. This ongoing project places writers into various area institutional and community libraries to read and be inspired by what they discover on the shelves. Being on land is apparently not a requirement of library participation in this program, so CHP put the word out and Steve Healey, Twin Cities poet and professor, signed on. 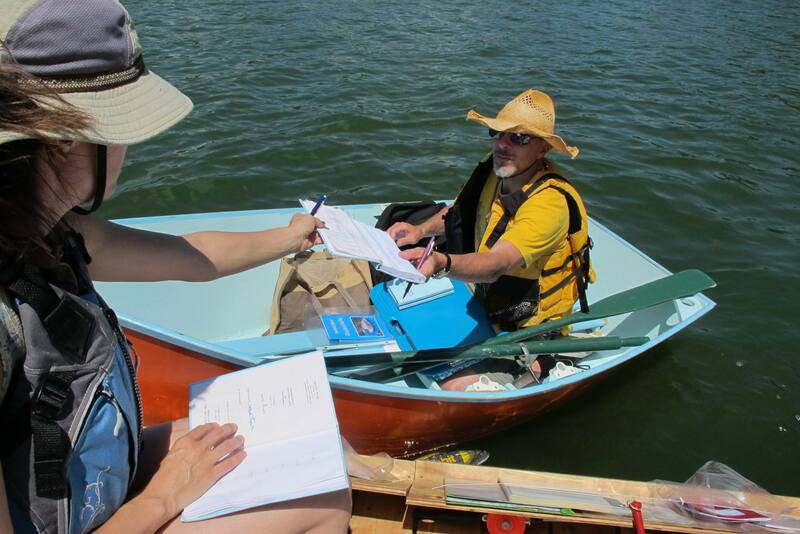 We assigned him the Library’s small, orange row boat, the Sea Clamp, as his transport vessel. This seemed most appropriate given the word play that is its name. For the first weekend of the Library, Steve spent his time reading nearly every book in the collection; a significant effort. He also assisted with the dipping of the books to complete Paul Ramsay’s contribution, A Book Dipped in Two Lakes. 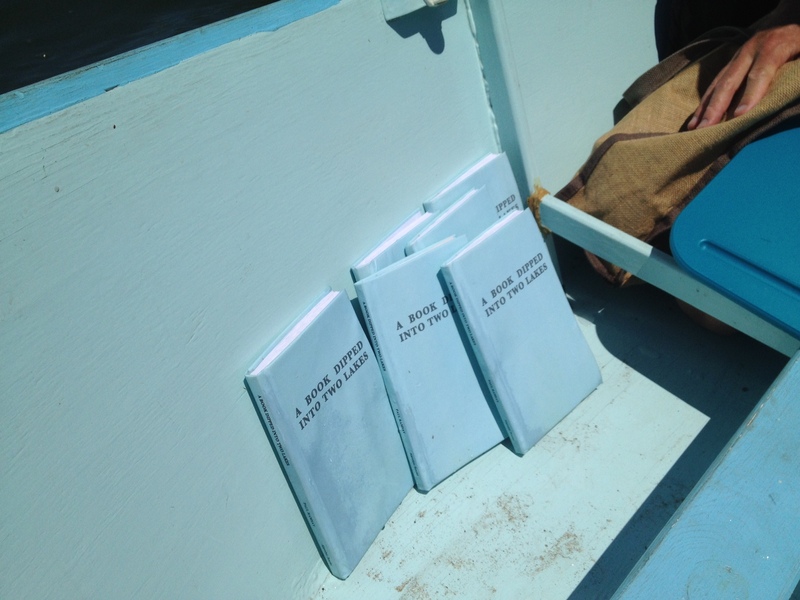 Books drying out in the Sea Clamp after their dip in Silver Lake. She chased the chickens. She loved me. 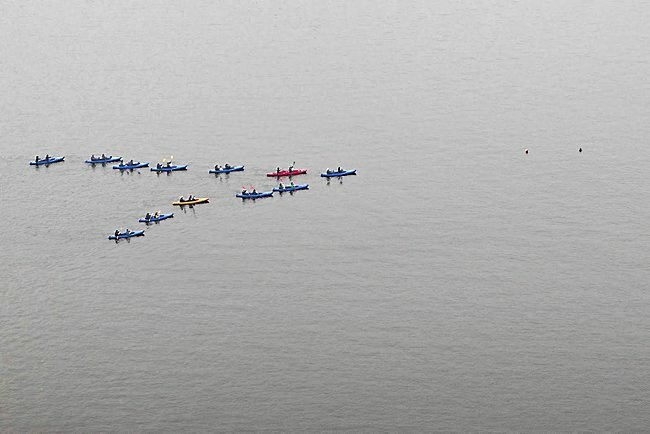 To participate, find the guy in the little orange boat. Steve Healey is the author of two books of poetry, 10 Mississippi and Earthling, both published by Coffee House Press. His poems have been published in magazines such as American Poetry Review, Boston Review, Denver Quarterly, Fence, and Jubilat. He teaches creative writing and English at Minneapolis Community & Technical College. Steve and Sarah conducted an interview about the Floating Library; find it in two parts here and here. 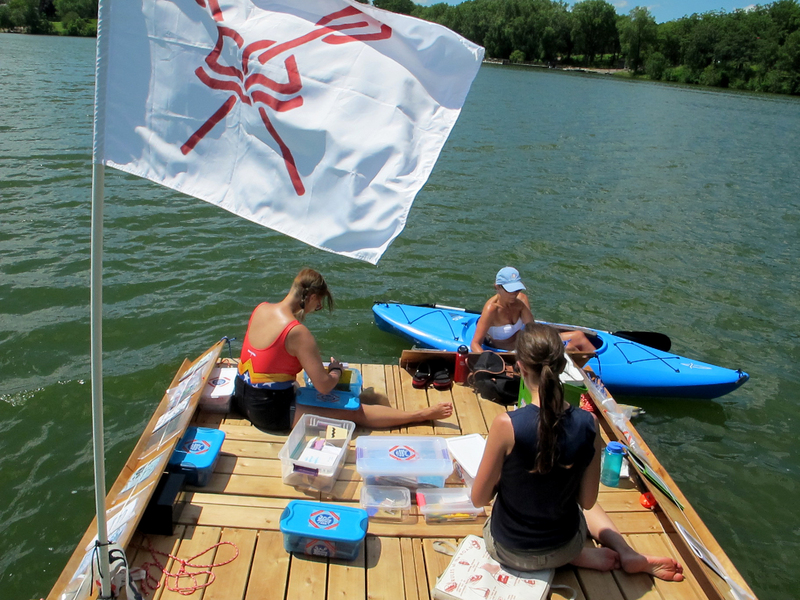 Reading and sunburning on the Floating Library.